Social Contribution Activities ? 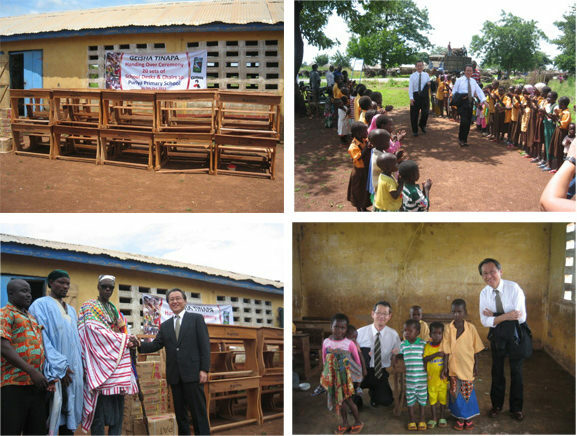 Providing the children of Ghana and Nigeria with educational materials such as desks and chairs, as well as T-shirts and our GEISHA canned foods. As one of our Social Contribution Activities, we have supported the children of the Puriya village (located in northern Ghana) and Benin City, Nigeria. We provided them with educational materials such as desks and chairs, as well as T-shirts and our GEISHA canned mackerel. Our work with the children in Ghana and Nigeria began last year, in celebration of our GEISHA brand’s 100 year anniversary. In cooperation with JFE Shoji Trade Corporation, we offered the educational materials to the children of both countries as a token of appreciation for the support of the brand. In addition, we held a ceremony in Puriya Primary School on 9th of October to which we received a warm welcome (with applause from the children) and were subsequently entertained with traditional African music and dancing from the village people. Consequently, we would like to declare that we are happy to continue with our Social Contribution Activities, taking into consideration some of their future needs and circumstances. Finally, we are determined to develop together with West Africa (including Ghana and Nigeria) in order to contribute toward building truly prosperous societies. *Puriya village : Located almost 600km north of Accra.